Coverage: Live text commentary online, on mobile, BBC Sport app; Updates on BBC Radio 5 live and on Final Score; Highlights on MOTD on BBC One 22:50 BST. Saturday's clash between Manchester United and Liverpool is a game neither manager can afford to lose, says former Liverpool defender Mark Lawrenson. 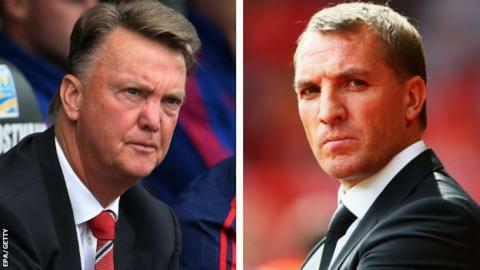 Lawrenson feels United boss Louis van Gaal and Liverpool's Brendan Rodgers are already under growing pressure. "Whatever happens at Old Trafford, there will be an over-reaction concerning the beaten team," he said. "Defeat would not actually be a crisis, but the loser would find himself under that kind of scrutiny." United and Liverpool both have seven points from their first four Premier League matches, and both lost their last game before the international break. Liverpool were beaten 3-0 at home by West Ham while United lost 2-1 at Swansea. "Losing at Swansea was United's first defeat of the season but people are now questioning Van Gaal's signings and his style of play," BBC football pundit Lawrenson added. "He has probably made them more difficult to beat but the problem is they have lost their attacking flair. "That is what scares teams, and they don't have it at the moment. Regardless of the start Van Gaal has made, he is already under pressure. "It is about standards. We are talking about United here, who are used to dominating games in the Champions League as well as the Premier League. Looking at them at the moment, I don't think they will be - their team is a bit like a patchwork quilt. "The David De Gea deal is a boost and something I thought might happen after he stayed on transfer deadline day, but United still have problems at the back. "Van Gaal has paired Chris Smalling, who has improved a lot this season and taken on the responsibility of leading the defence, with Daley Blind, who reads the game extremely well. "But if you are a top striker in the Premier League, and you are up against Smalling and Blind then you must be thinking you are going to score. They are not exactly Rio Ferdinand and Nemanja Vidic, or Steve Bruce and Gary Pallister are they? Rodgers' position has been in doubt before and defeat would bring more speculation about his future. "Saturday could be a crossroads game for Brendan," added Lawrenson. "Like United, Liverpool have made a good start in terms of results but their performances have been less convincing. "They looked all right when they were sat on seven points from three games before they played West Ham but, all of a sudden, that game left a lot of people saying they are not sure about him again. "He was always living on something of a knife edge after what happened last season, but I did not think that would happen after one defeat. "The fans are becoming a little apathetic, which will not help his cause. I have never seen Anfield empty as early before the end of the game as it was during that defeat by West Ham." Can Martial increase United's threat? After scoring three goals in their first four league games, United moved to bolster their attack before the transfer window closed by spending £36m on 19-year-old Monaco forward Anthony Martial, a world-record fee for a teenager. Martial, who has completed 90 minutes just seven times in senior football, scored 15 goals in 74 appearances for Monaco. "It is massive money for someone who is going to take a long time to mature," added Lawrenson. "Martial has got tremendous potential but he has barely played. If he starts every week for United, what is that saying? That there is no-one else." United's other big forward signing over the summer saw 21-year-old Memphis Depay arrive for £31m from PSV Eindhoven in June. "Memphis is a bit older and a bit further along in his development than Martial," Lawrenson said. "But United's two big signings in attack are both kids, who are talented but are going to be hit and miss by virtue of the fact they are young and inexperienced." Liverpool also spent heavily on new forwards over the summer, including £29m for Roberto Firmino and £32.5m for Christian Benteke. "The difference between Benteke and the forwards that United have brought in is that he is a proven Premier League goalscorer, while United do not know what they are getting," said Lawrenson. "They know Benteke will score but Liverpool's problem is getting the best out of him. Football is really simple sometimes - give your striker the service and he will get you the goals. "With Benteke, the way to do that is to deliver crosses into the box, but that is hard when Liverpool lack width in their attack. "That was one of their big problems against West Ham. Instead they were going down the middle all the time and found it really difficult. "Using former Liverpool forward Raheem Sterling as an example, what he has done since joining Manchester City is make the pitch wider for the rest of their attacking players. "What Liverpool are doing this season is making the pitch narrower, and relying on their full-backs for width rather than their forwards. It has not worked for them so far." Read Lawro's predictions for this week here.